Want to support Celiac Disease Research and Lucas Rodriguez, an AMAZING high school student and Celiac diagnosed in 2013? 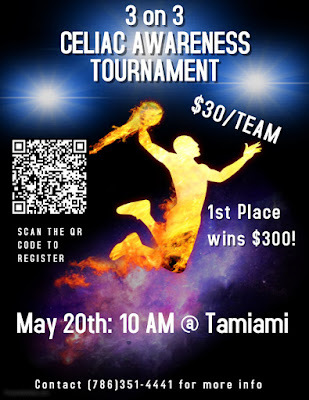 Lucas is starting an annual basketball tournament to raise money and awareness for Celiac Disease. On May 20th, at Tamiami Basketball, he will be hosting a 32-team 3 on 3 basketball tournament with the intention of raising awareness to the people of Miami about this disease. To register for the basketball tournament - use the QR code on the image to the left, or contact 786-351-4441 for more information. He hopes to raise over $10,000 with our help. Please spread the word!! You may donate to this great cause here: https://www.gofundme.com/3on3-celiac-awareness! If you're like me, one of the most difficult things about living with celiac disease is saying goodbye to some of your favorite childhood foods. Now imagine if you're someone who isn't suffering from celiac disease, but have chosen to adopt a gluten free lifestyle in order to support someone who has. If you're lucky enough to live with someone this supportive, then perhaps the only thing that makes you happier than finding a gluten-free version of one of your most-missed-foods, is when you can find one of theirs! My husband loves corn dogs. In fact, judging by every birthday party, playground, fair ground and sporting event photo I have seen from between the ages of 2 and 20 something, I think it's safe to say he grew up on them. 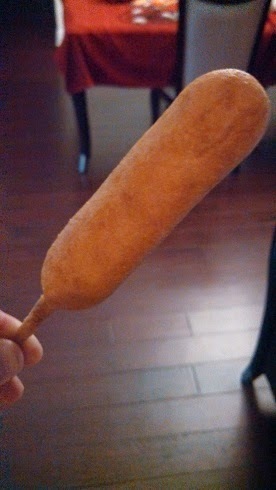 We were lucky enough to discover Foster Farms gluten free corn dogs, and we both agree they're delicious! 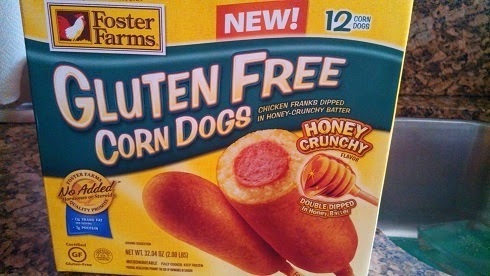 It turns out these delicious golden brown treats on a stick are but one product of an impressive gluten free line-up produced by Foster Farms. Now, for those of you who are looking to stay away from red meat and/or pork products, the franks in the center are made from chicken, but still have that juicy, smoky, salty flavor that works so well with the sweet batter which surrounds it. 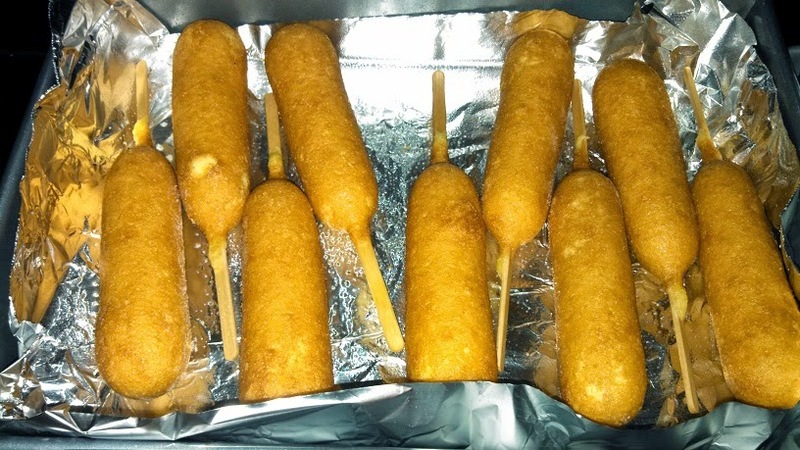 These corn dogs can be prepared in the oven, deep fryer or microwave. We tried all three ways and found that we liked the oven best. The corn dogs come having already been pre-fried and we didn't see too much difference between re-frying them and heating them in the oven. Obviously, the microwave was our least favorite method, but still very edible, and in a pinch perfectly good compared to other food-on-the-go options. We found that wrapping them in a moist paper towel does preserve the corn batter coating a bit more in the microwave. On the corn dogs themselves, there is not much we can say other than these are really good corn dogs-- not good gluten free corn dogs, or good for gluten free corn dogs-- just really good corn dogs. 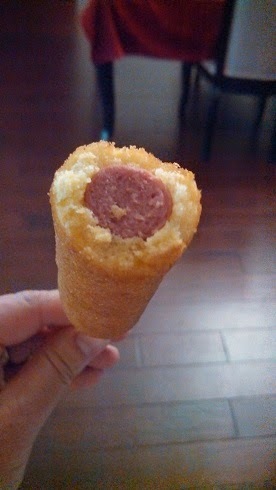 The batter has a nice balance of sweet corn and honey which come together nicely into that fried corn bread texture which traps the moisture and savory flavors of the hot dog. Our favorite topping was a spicy yellow mustard sauce we made by combining classic yellow mustard and tangy horseradish. For those of you who like the heat some mince jalapeno or a splash of tabasco really help create a sweet, savory and spicy masterpiece! 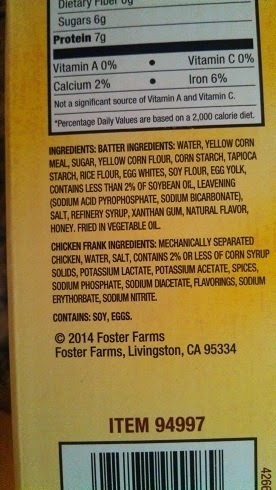 FDA FINALLY ISSUES DEFINITION OF "GLUTEN FREE"!!! HOT OFF THE PRESS!!! I can barely breathe; I'm so excited!!! FDA issued the update below today DEFINING Gluten Free (which us Celiac's have been waiting years for)! My sincere hope is FDA will now test imported products that make "GLUTEN FREE" claims, and assure these companies are legitimately using the gluten free claim - and enforce and penalize those that are importing misbranded product and not correctly utilizing the gluten free claim! The "COMPLIANCE DATE" for this final rule is August 5, 2014. If you see products labeled "gluten free" you should be able to TRUST that those products legitimately do not contain gluten. Now, we have a standard. They will contain LESS than 20 parts per million of gluten. This is a fantastic start!!! Here's what the FDA had to say, and the actual FINAL RULE is included as a hyperlink at the end. Does Your Primary Doctor Speak Celiac? If so, SHARE! 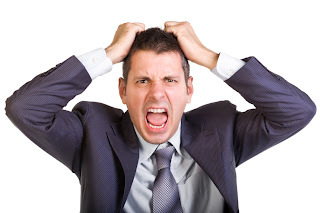 I feel like this guy when I think of continuing care for a Celiac. Maybe you feel the same, hence why I'm writing... We ALL have our crazy journey's before getting diagnosed with Celiac disease... My big question is... THEN WHAT? 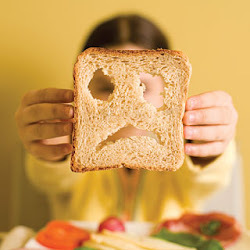 So... You're on a gluten free diet... BUT, what about your continuing care??? I want to hear from YOU and want your recommendations. Do you have a primary physician or nutritionist that's a rock star? If so, name drop here, and more importantly, SHARE WHY! Do you do testing every so often, do you check vitamin levels, what? As I'm looking for a new primary doctor, I want one that speaks Celiac - that gets what my body has gone through and knows what to look out for during regular check ups to keep me on track. Suggestions welcome - rock stars only - and South Florida area. If you're provider does something specific - SHARE and TEACH us - so we can bring this information to our doctors. So impressed with this FREE celiac screening event - had to spread the word. You need to as well. individuals affected by other autoimmune disorders commonly associated with CD. This is your chance to encourage your friends, neighbors, co-workers & family members to finally be tested. In early September we will post info on how to make your appointment. Ina, aka the Breakfast Queen, in Chicago, Illinois knows all about being gluten-free accommodating. Yes, my mom's name is also Ina, so I was doubly intrigued to find out if Ina's was all I heard it was cracked up to be. Ina, a leader in the effort to ban artificial trans fats, opened up Ina's Kitchen in 1991. Ina understands and teaches cross contamination and is a hands on owner. Her menu has GF all over it to signify those options that are gluten free accommodating. Nobu has 24 locations world wide. I was fortunate to dine at Nobu 57, in NYC. If I had to summarize the experience (and yes, Nobu is an experience) into one word, it'd be WOAH!! Expensive, oh yeah (but, what isn't in New York?)!! Worth it? Read on! Sprinkles Cupcakes makes a delish' gluten free red velvet cupcake and a plethora of other (unfortunately non gluten free) cupcakes. I was recently in Chicago, and read rave reviews about their gluten free cupcake, so I had to try it for myself, right?! "more and more customers are asking for gluten free and vegetarian options. It is becoming the new food revolution that other caterers neglect. This is why I have dedicated a section of my website and my business to fill this void and to inform people of the gluten free choices that are out there in the world." When booking a vacation, Celiac's have to be extra special careful. I LOVE cruisin' and happened to be going to Europe for work - so why not add some fun time too?! I decided to try a Mediterranean Cruise. 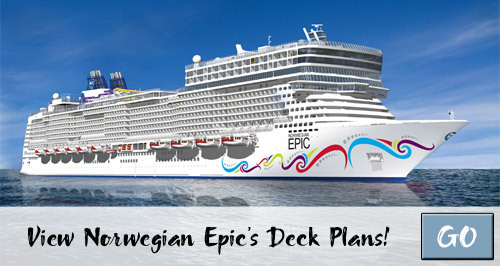 The Norwegian Epic lined up perfectly with my schedule. The itinerary was a dream. Seriously, doesn't this look amazing (the port of call were!)? ?